What is High Context Culture? 1 What is High Context Culture? 1.1 Comments? Leave them at the end of this post! You might have heard of these words: high context culture and low context culture. But what is it and, if you’re working with different cultures, why is it important to understand the differences? In an earlier post, I discussed what is Individualism and the difference with Collectivism. Apart from explaining the two, it makes sense to add some consequences of this difference when it comes to Cultural Communication. Depending on your cultural background, your answer may differ. I use this example question in my Cultural Awareness Trainings often. Mind you it’s an illustration and an example! Obviously answers from different people are not the same. The point I’m trying to make here is that Individualistic cultures have a tendency to communicate rather Direct. While Collectivistic cultures have a tendency to communicate more Indirect. This cultural difference between Individualistic and Collectivistic cultures leads to many communication problems and potential frustration. In addition, it influences both perceptions: Individualistic cultures get frustrated (yes they do) because the Indirect Collectivistic way of communicating does not give them the clarity (and directness) they “need”. Collectivistic cultures often find the Direct communications of Individualistic cultures rude and crude. To put it in a picture, please have a look below. On the left-hand side is the Individualistic way of communicating. On the right-hand side the Collectivistic way of communicating. 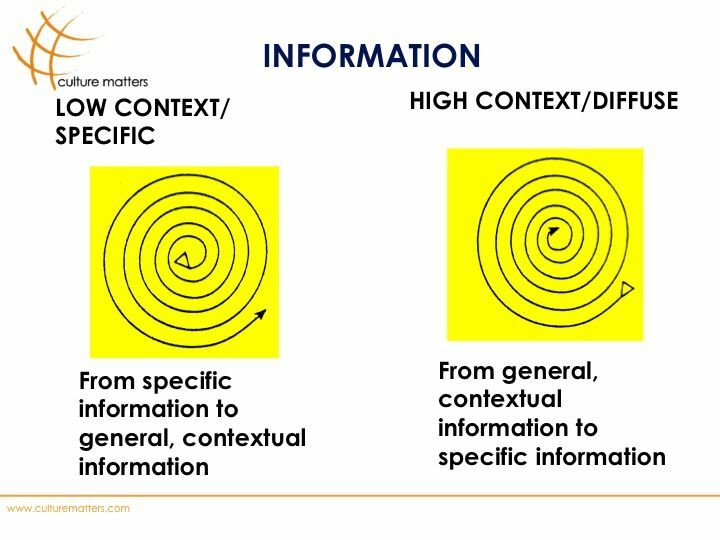 The difference between High and Low Context Culture is that Low Context Cultures (Individualistic Cultures) do not need a lot of additional (Contextual) information to engage in “a communication“. The reverse holds true for High (Collectivistic) Context Cultures. Cultural Communication is always a challenge. And when our frustration kicks in, we usually go back to our own “default” behavior, which is not always the most productive in such situations. What helps is asking how you can help your counter part in getting what they need. And exploring the reply of the other party further by asking more questions. Comments? Leave them at the end of this post! Interesting short blog. However I must take the critical stand point and question the idea that we can allow ourselves to communicate across cultures based on sweeping generalisations. Been a masters student and currently researching into Cultural Intelligence, I worry that instead of meeting cultures that are different from ones own on the context of the meeting, we tend to ‘warn’ people of potential miscommunication based on (excuse the word) cultural stereotypes. I wonder if seeing a meeting as a process rather then A meets B might be something that would be an alternative. Of course, there are marked differences in cultural practice and in the way we might view our world based on cultural embedded understandings – and we need to be aware of these – however shouldn’t we only be aware of these on a very superficial level; as a starting point of sorts. Is there not a problem of setting up ‘frames of reference’ that help to create and reinforce these same frames of reference in a culturally mixed meeting? Experience teaches us that the cultural difference might be stereotypical, but are all too common and “real” to people. I even think that thinking superficially about cultural differences might be dangerous, because you might miss the essence of possible friction. I can see why you might think it might be dangerous, and yes I agree – ignoring culture (in the given context) can be dangerous, however let me clarify. I’m not saying we should not take culture into account, nor think as culture as superfluous, only that for initial meetings between cultures, that our stereotypes not dominate our initial reactions. For example: ‘Oh ‘x’ didn’t shake your hand? Yeah, that makes sense he’s from ‘y”. I think it is fair to say that experience also tells us that grand theories of human beings can lead us just as much down the stray path as no theories of human beings. So in other words, I think an awareness of cultural difference is important – even necessary – its when we begin to see the world through these generalisation instead of what the cultural person is trying to ‘show’ us where I have reservations. I biggest bone to pick, is that it gives us a rather ‘solid-unchanging’ view of cultural beings, instead of ones that are in constant change and redefinition. However, I’d like to learn more about how these ‘cultural communication skills’ are taught in practice, can you shed some light on what literature one might get ones hands on? Totally agree with your last comment above. Absolutely. There is plenty of literature out there. Not all are good! I’m putting together an E-book that will come out around September 2012 (I think you already registered for that). You do need to register (for spam reasons). There’s a whole list of books and readings there. All link directly to the Amazon book store. 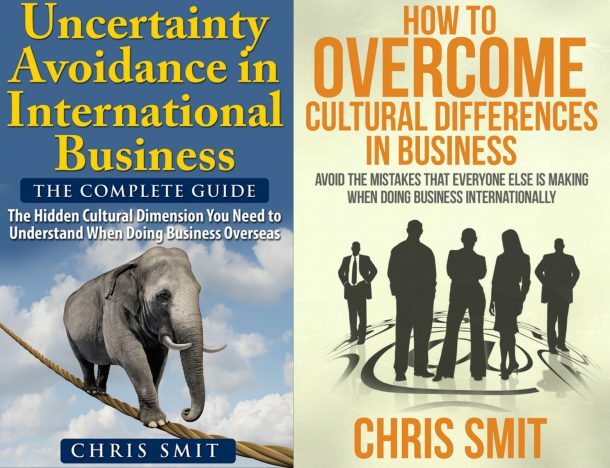 What if your organization operates in high context culture how does it communicates with other cultures ?? Supposedly you point to communication between High Context cultures and Low Context cultures. If that’s the case than High Context cultures can benefit by communicating more directly; indeed using less context.